If attendance numbers are an indication of passionate fan bases, and they are, the Nebraska Cornhuskers’ women’s volleyball team might have the most passionate in all of college volleyball. Nebraska fans took that to the next level on Saturday, when they sold out their scrimmage. On Saturday at 3PM, the Nebraska Cornhuskers drew an official crowd of 7,965 to the Devaney Center, which is officially a sellout for women’s volleyball matches. While the Devaney Center, officially opened in 2013, has a listed capacity of 7,907, Nebraska regularly oversells that. They averaged 8,202 fans for home matches in 2017, which is 103.73% of the stadium’s capacity. Nebraska, which regularly draws the biggest crowds in college volleyball (both at home and on the road) is used to sell-out crowds: the entire home schedule is already sold out for the 2018 season. But this is the first time they have sold out the annual red-white scrimmage to open the season – which happened a week before the match. A number of factors played into the boost, not the least of which was the celebration for the team’s 2017 NCAA National Championship. After their last national title in 2014, though, the 2015 red-white scrimmage ‘only’ drew 6,270. It was also Nebraska football fan day, and there was a documentary debuted about the 2017 title run in the arena after the match. On the court, the red team beat the white team 2-1 (25-19, 25-17, 20-25) in one of the more significant exhibition matches for the team in recent seasons. Notably absent from the court was All-Big 12 transfer Lexi Sun, who is rehabbing an injury and is questionable for the Huskers’ formal opener against Florida on August 24th (at home). According to the Lincoln Journal Star, she may be limited to defensive and serving duties to start the season. “We’re putting a lot of stock into what happens (Saturday) because it’s going to give us a great indication of who is going to perform when there is a big crowd, lights are on, pressure, big match, TV, all that stuff,” Nebraska head coach John Cook said before the match. If he’s true to his word, then it appears that freshman Nicklin Hames is the front-runner for the starting spot at setter, which is the biggest question-mark for the team this season. She played all 3 sets for the red team, with 26 assists and 3 kills on 3 swings in the match. She also chipped in 3 service aces, which thrice that of any other player in the game. Her primary challengers for that position, Mari Kurkova and Brooke Smith, split time for the white team, and had 15 and 7 assists, respectively. Neither had an ace in the match, and they combined for just 2 kills on 8 swings. The red team also had a more efficient hitting percentage (.187) with Hamlin at setter than did the white team. 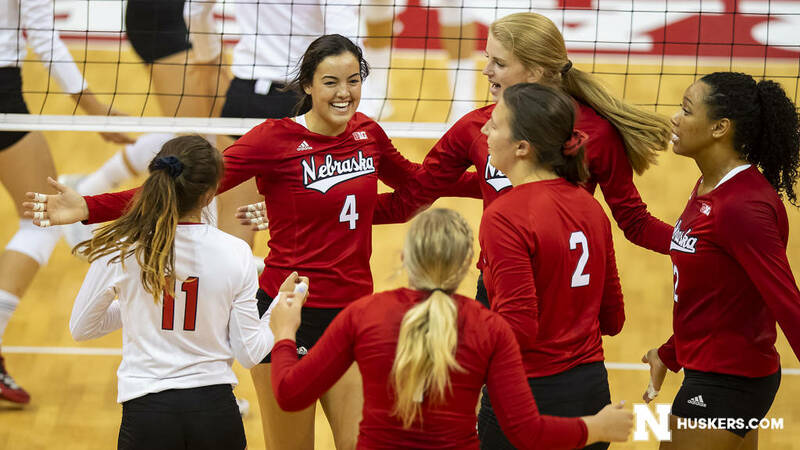 While Hamlin was setting to players like Mikaela Foecke and Jazz Sweet, who are expected to start for Nebraska this season, the white team included former Nebraska stars Katie and Amber Rolfzen, and student manager Jake Roberts (who had 6 kills and hit .308). sophomore outside hitter Anezka Szabo had 5 block assists for the white team, while freshman middle blocker Calli Schwarzebach had the same for the red team.